Time to make a difference, Chicago. 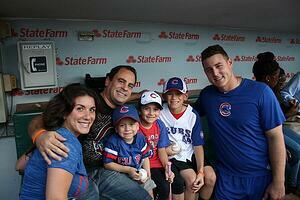 Take the CAC Champion Challenge benefitting the Anthony Rizzo Family Foundation. It's pretty easy these days to get lost in our own lives. Work, family, daily stresses - all throwing up blinders that insulate us in a bubble of self-concern. One of the very best things for our health is taking time out to think about others, and help out when we can. Generosity of spirit is a key element that keep us present, engaged in our community and generally feeling pretty good about life. Chicago Athletic Clubs is making it easy for you to make time to care for others and yourself! Our Champion Challenge is a fitness fundraising extravaganza that gives you the opportunity to raise money for a great cause - the Anthony Rizzo Family Foundation - while challenging yourself to have some serious fun! Register for the Champion Challenge now to be a part of this epic event! 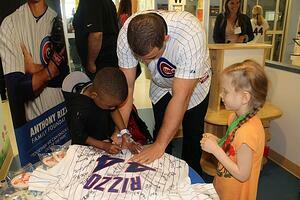 What is the Anthony Rizzo Family Foundation? 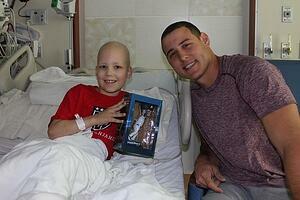 The Anthony Rizzo Family Foundation is a 501 (c)(3) non-profit organization that focuses on raising money to provide support to children and their families battling cancer. They believe that cancer does not just affect the individual diagnosed, but everyone around them; and likewise, an individual doesn't battle cancer alone but truly the whole family battles it together. Anthony Rizzo, first baseman of the world famous Chicago Cubs, knows this to be true because he experienced it first hand when in 2008 he was diagnosed with Hodgkin's Lymphoma. His six month chemotherapy treatment occurred at the very same time that his grandmother was battling breast cancer. In Anthony's words, "I realized that no matter how difficult fighting cancer was for me, it was even more difficult for my family." 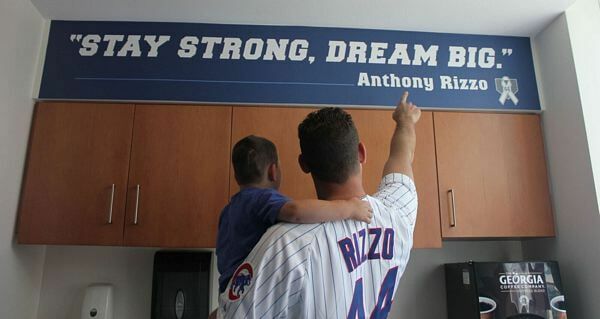 In 2012, after his battle with cancer was won, Anthony Rizzo founded the organization to help families struggling with the emotional and financial burden of cancer. "We created this foundation so no parent ever has to choose between paying a bill and saving their child's life." "We get to help families through the darkest times of their lives," say Abby Saurez, Executive Director and sole employee of the Anthony Rizzo Family Foundation. Aside from Abby, the entire organization is run by the Rizzo family. His parents, his brother and he are hands on when it comes to organizing and representing in fundraising events and efforts throughout Chicago like Laugh-offs, Cook-offs, Walk-offs and more. Anthony himself is a frequent visitor to Children's hospitals to talk kids through their experiences and provide crucial support, for the kids and their parents. And how does Abby feel about her job as the foundation's sole employee? "I'm one of the luckiest people in the world," she says. Suarez used to be the manager of fundraising events for Cubs' charities before she made the move to work with the family and their foundation full time almost 3 years ago, and she sees her contribution as humbling and rewarding. "In these situations, there is so much emotional stress already, the financial stress is something we can help relieve." She is all to familiar with heart breaking stories about parents who are told they can't have the medicine that will save their child's life because it is too expensive, or because of financial reasons are forced to return to work during the last two weeks of hospice for their child. "It's crazy what some parents have to do, and we get to help." Donations to the foundation provide the funds for everything a family needs, from paying for rent, utilities, car payments, food - anything that makes the parents able to focus solely on being by their child's side. Chicago Athletic Clubs is offering the Champion Challenge on Thursday, September 13th 2018, 5:30 pm at Lakeview Athletic Club as a fundraising event for the Anthony Rizzo Family Foundation, an opportunity for anyone in Chicago to have the opportunity to make a difference for families battling pediatric cancer. For a minimum $200 raised contribution, you too can help these children and their parents make it through their darkest hours. The Champion Challenge is a fitness event consisting of 20 minutes of Cycling, 20 minutes of BodyPump Strength Endurance & 20 minute Functional Challenge Course. The Challenge is one hour and open to all fitness levels. Not interested in sweating? Grab a coveted spot as a Challenge Cheerleader. Of course, if you can't make the event, donations of any kind are always welcome. The more money you raise, the more perks you get, like event tank tops or duffel bags. Plus, we're keeping it fun by offering team prizes in categories like Best Dressed (get creative! ), Best Team Name, Most Team Members & Most Team Spirit. There is truly no better contribution to your own health than taking the time to help others. For the fitness minded, this fundraiser is a no brainer. If after all this you still aren't convinced, just watch the video below. So take the challenge. Sign up now, we'll see you on September 13th! Yoga at the Robey Hotel, powered by CAC! Free Summer Fitness Series at Gallagher Way - hosted by CAC!